"The National Weather Service forecast, as you know, is for a winter storm watch and they were correct. We have a winter storm in the process now. "Snow will affect millions across the northeast into Thursday. 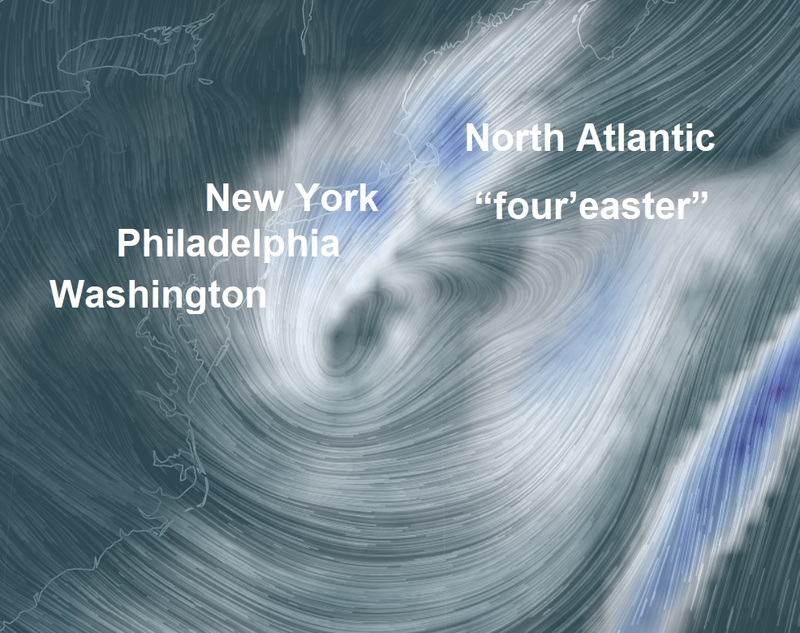 As AccuWeather predicted in its long-range winter forecasts back in October, March has proven to be an active month with this being the fourth powerful Nor’easter in a month. Flight cancellations, transportation delays, and damage to personal property from falling trees and power lines will cause this to be yet another high-impact economic disruption," AccuWeather Senior Meteorologist and Long-Range Forecaster David Samuhel said. Meanwhile, more than 50,000 southern New Jersey residents are living without power as Wednesday's nor'easter continues to wreak havoc. Atlantic City Electric (ACE) outage map shows that 57,987 of its customers are without power as of 11:10 p.m. Most of the darkened homes are located in Cumberland, Salem and Gloucester County where there are more trees, according to ACE spokesperson Frank Tedesco. "Winter Storm Toby's heavy, wet snow, ice, and high winds have toppled trees and brought down tree limbs, downing utility poles, power lines and damaged electric equipment, causing electric service interruptions for customers," Tedesco said. "Atlantic City Electric's entire Emergency Response Organization has been mobilized with all company resources dedicated to restoring service to customers as safely and efficiently as possible," Tedesco said 180 internal linemen, 131 overhead line contractors and 233 tree crew personnel are working to fix the various issues, but that there is no timetable for when power will be restored. ..."as AccuWeather predicted in their long range forecast from October"? Give me a break; you have to see through the smoke and mirrors by now and stop continuing the false narratives. Geoengineering is the greatest threat to humanity. Nothing natural about these 'storms'. Wake up and stop monsanto/climate corporation/US elitists!! NOAA, NASA BBC and many more warned us of the effects of the "LA NINA" winter of 2017/18, Jae, reporting extreme weather events is only a small part of The Big Wobble, my objective is to report all things which are destroying our planet at the moment and I'm absolutely sure geoengineering is behind much of the disasters happening right now but I have no expertise or evidence or time to focus on geoengineering because I am trying to present a bigger picture of the destruction of our world. Geoengineering is not the greatest threat to humanity but the man himself is, so forgiven me for not jumping on your crusade but there is something much bigger going on out there than geoengineering.